The note is seemingly being “used more for hiding things than buying them”. EUROPE’S €500 NOTE is so tainted by its association with money laundering, the black market and terrorist financing it should be withdrawn from circulation, EU finance ministers said yesterday. The colourful violet €500 note is the largest eurozone unit but Europol, the EU’s police agency, has long suspected that criminals find it a useful way of moving large sums of money around without the authorities knowing. French Finance Minister Michel Sapin said the note was “used more for hiding things than buying them”. It is used more to facilitate transactions which are not honest than to allow you and me to buy food to eat. Ministers discussed plans drawn up to curb terrorist financing pushed especially by France in the aftermath of the bloody series of attacks in Paris in 2015 but which the European Union has been mulling for some time. Ministers backed the proposals which included a call to the European Commission, the EU’s executive arm, to consider what could be done. “The Commission (should) explore the need for appropriate restrictions on cash payments exceeding certain thresholds and to engage with the European Central Bank to consider appropriate measures regarding high denomination notes, in particular the €500 note,” a statement said. The Commission should take account a recent Europol analysis and present its findings by May, the statement said. Europol has warned for years of the importance to track money flows in the fight against terrorism, corruption, fraud and a host of criminal activities. The €500 note accounts for 3% of the total euro notes in circulation but represents 28% by value, according to ECB data. 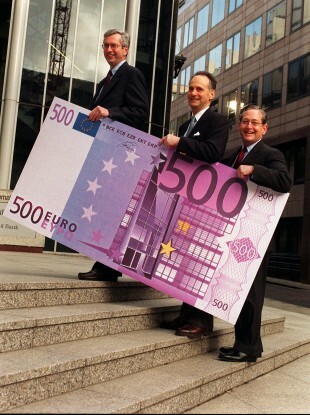 Email “You better spend your €500 notes quickly, the big purple one could soon be scrapped”. Feedback on “You better spend your €500 notes quickly, the big purple one could soon be scrapped”.